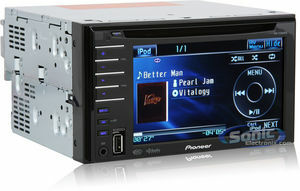 Pioneer car stereos are well known for their excellent dependability, design practicality, and fantastic performance. Given that a head unit is the center piece of your sound system, it is important to make the right choice. Aftermarket in-dash car stereos offer such a wide variety of features and capabilities that it can be overwhelming when you try to figure out which model is best for you. Pioneer models are a good place to start your search because the Pioneer brand has always produced stereos you can count on. If your vehicle can accommodate a double din sized head unit, the Pioneer AVH-P3100DVD 5.8” touchscreen is an excellent choice. This is not your ordinary DVD/CD/MP3 player. One thing that sticks out in particular about this model is its exclusive Touchslide technology. This allows you to search (rewind/fast forward) through your music by sliding your finger across the touchscreen. You can also use the touchscreen to control DVD playback or to use your iPod, USB and other connected modules through the stereo. When you’re not playing music, you can enjoy watching your DVD movies on the vivid LCD display. The two most common complaints about in-dash LCD screens are glare and reflection from the sunlight. To combat this, the AVH-P3100DVD’s widescreen is specially designed with a special layer of gloss to reduce glare. This results in a clear picture that is easily readable and perfect for vehicle use. The display also has five customizable color schemes, which makes a great looking unit that much more aesthetically pleasing. The sound quality is amazing. The built-in amplifier and 3-band EQ produces a finely tuned sound. If you want additional power, the two sets of 4V preamp outputs enable you to add amplifiers. This unit also has further expandability options, as the AVH-P3100DVD is compatible with the iPod (via front aux input, adaptor required), Bluetooth (adapter required), satellite radio (requires an antenna, subscription and tuner), and HD Radio (tuner required). For a safer drive, you can configure it with your vehicle’s steering wheel controls (adapter required) or even a backup camera. The next step up from the 3100 is the AVH-P4100DVD. This head unit is another great option for a double din dash opening. At 7 inches, this unit has a bigger LCD touchscreen. The 4100’s touchscreen functionality and display is comparable to the 3100, only larger. As a head unit, it has many of the same options as the AVH-P3100DVD along with a few extras. It has three sets of 4V preamp outputs (one more than the 3100 ), which allows for additional expansion possibilities. One of the preamp outputs is designated as a subwoofer preamp output (the 3100 does not have one of these). On the other hand, the 4100 has neither a front aux input nor a front USB input, while the 3100 has both. So while the 4100 is clearly an upgrade, you get a few different options from each head unit. Select the one that best suits your needs. Lastly, in case those of you with a single din dash opening have become intrigued with Pioneer stereos, the AVH-P5100DVD is a nice alternative with similar features. This unit fits in a single din opening because it has a motorized, fold-out 7” inch touchscreen monitor. Like the other two models mentioned above, it is a DVD/CD/MP3 player. The AVH-P5100DVD has all of the options the 3100 has except it does not have a front USB or aux input (instead it has rear inputs for both). Unlike the double din stereos, this model can “hide” its screen, as it is fully retractable. The screen is also detachable. These options are help prevent theft because you can keep your screen hidden while driving or remove it altogether when you park. All three of these Pioneer stereos are available and in stock. If you are unsure of your vehicle’s dash opening size, check out our double din fit guide. I have a 5.1CH amp that takes normal Toslink/SPDIF Optical input. Can the AVH-P3100DVD be connected directly to my amp via a standard Optical cable or do a I need special cable from Pioneer or is there an alternative connector to utilze a standard optical cable? You’re looking for a Digital Output for a Dolby Digital Surround sound amplifier. Instead of using standard right/left Channel RCAs it uses a single optical cable for all 5.1 channels. The only units that have this output that I am aware of are the Higher end JVCs and Alpines. Pioneer does not support digital outputs, even their 5.1 Dolby Decoder uses standard RCAs that would not work for an amp requiring digital input. You should purchase a unit such as the JVC KW-AVX820 or the Alpine IVAW505. “Pioneer does not support digital outputs”? Then I must have been mislead by the advertising on the box packaging of this HU. It clearly shows the logo and states “dts digital out”. The digital optical term is also stamped on the back of the HU as well. Page 10 and 11 of the installation manual shows the connection process to the Optical Output on the back right bottom of the HU. I showed a picture of the rear panel to a professional who told me that that optical output connector is a mini toslink connector. Can you confirm that? The manual also goes on to show the incorporation of the DEQ-P8000 via an “optical cable connection box”. Can you confirm that that “optical cable connection box” is the Pioneer CDE6690? Can you tell me the cost and purpose of that box? The optical digital output on the rear of the headunit is proprietary to the Pioneer unit, but yes does look to be a mini-toslink connector. This unit requires the addition of the DEQ-P8000 Digital Processor in order to support the DTS, or Dolby Digital features of the head-unit. To clear up any confusion, the DEQ-P8000 would not connect to your amplifier using Optical connections. The Digital Processor connects to separate 2-channel amplifiers via RCA cable, so if you have an amplifier requiring an Optical input you will not be able to use the Pioneer AVHP-3100DVD. The JVC unit has the digital processor built-in and a Toslink connection on the back of the unit for direct hook-up to your digital AV amplifier. This information was gathered using Pioneer’s free reference material. All sources say that the DEQ-P8000 is necessary for digital reproduction. If you are trying to use your own amplifier that has a built in processor, I’d recommend contacting Pioneer directly to check it’s compatibility. When using this unit with a Pioneer multichannel processor, you can enjoy the atmosphere and excitement provided by DVD movie and music software featuring 5.1 channel recordings.